All trees need pruning at some time. For most trees, the best time for pruning is while they are still young. Periodic structural pruning while a tree is still small creates a much stronger tree that will be healthier and look better for years to come. To maintain good health, large trees should also be pruned periodically. It is important to remove dead and rubbing branches which can allow decay into the tree. Sometimes trees must be pruned away from buildings or objects. It is very important to prune a tree properly. An improper pruning can inflict injuries on a tree from which it can not recover. Proper mulching is very important to the health of trees and shrubs. Mulch holds in moisture, keeps mowers and equipment away from trees, slows competition with weeds and turf, and helps to keep the soil warm in the winter and cool in the summer. However, It is important to not mulch too deeply and to keep the mulch away from the base of the tree. Mulch against the tree trunk can create many problems for the tree. Fertilization is important for maintaining the health and vigor of your trees. Also, a vigorous tree is less susceptible to insects and diseases. Fertilization can be done in a variety of ways. After we evaluate your trees, we can recommend the best options for your situation. Many urban soils are compacted which means that trees are not receiving the oxygen that they need. By aerating the soil, we can break through this compaction, opening up the soil up for oxygen and moisture movement to the roots of the trees. This can be very important for trees that have been damaged by construction. Aeration is also good time to apply fertilizer or soil amendments. Cabling and bracing can be an effective method for extending the life of a tree that has lost some of its structural integrity. If you have concerns about the structural integrity of your trees, we can perform an evaluation and make recommendations. There are times when trees must be removed. 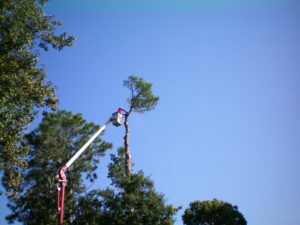 We specialize in removing trees in hard to reach areas. We can remove trees from just about any area with minimal damage to the surrounding landscape. We can do a comprehensive evaluation all of your trees and shrubs and make recommendations to improve their health and beauty. The best treatment for all insect and disease problems is prevention. The best method of prevention is good tree health. A tree that is stressed is far more susceptible to problems. We will work with you to eliminate major stresses on a tree before it has any problems. However, even with good management, there will be times when a tree must be treated for a problem. When treatment is needed, we use the most safe, up-to-date methods available. If you are preparing to build on a wooded lot and the health of the trees on the lot is important to you, the best thing you can do is to retain the services of an arborist to assess the site while you are still in the planning stages of your construction project. An arborist can help you identify the trees that you want to save, and formulate a plan to protect those trees from injury and soil compaction, so you can accomplish the goal of saving them and maintaining their health. We can evaluate the condition and structural stability of your trees and make recommendations on steps to take to increase their safety and reduce the potential for damage to the surrounding property. Improper tree planting is a widespread problem today. One study by researchers at the Bartlett Tree Research Laboratories found that 93% of trees planted over a two-year period had excessive soil or mulch covering the root collar. The problems associated with improper planting may not be evident for months or even years. A properly planted tree will have a visible root flare. If you are planning to have trees planted on your property, call us, and we will explain some steps to take to ensure that your trees are planted correctly. If you would like, we can plant trees for you ourselves. We will work with you to select species that will fit your site and meet your needs. We service Fort Walton Beach, Shalimar, Niceville, Valparaiso, Crestview, Destin, Miramar Beach, Santa Rosa Beach, 30A, Grayton Beach, Seascape, Seagrove Beach, Dune Allen Beach, and Freeport, Florida. We offer free estimates to our customers!